C’mon! Your kids will adore you forever if you buy them one of these! It’s an inflatable water slide, ideal for those summer afternoons when the children get bored too easily. And of course their friends are always welcome too. The slide comes with an electric air blower and it apparently only takes a few minutes to set it up in the back garden and inflate it. The overpressure from the blower is claimed to be enough tomaintain rigidity, even if it gets damaged by small pinholes. Water’s fed to the top via a garden hose. You can almost hear the screams of delight as the children wait impatiently in the back garden for the thing to inflate. When the summer’s over, the thing can roll up and squeeze somewhere in the garage or loft. What is an inflatable slide? 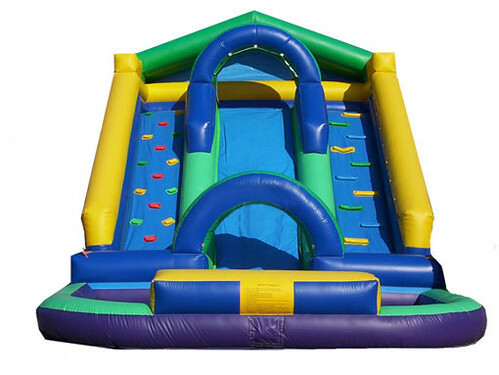 Features: The inflatable slides have various and changeable styles ,which bring dynamic and strong taste pleasure ,excitement and also safety .It is deeply loved by the children .The specifications of the inflatable slides can be large or small .It owns distinguished features ,such as safe ,comfortable , convenient and fast characteristics. Wherever in the park , square ,or along the road of a block ,it just needs a space, with few dozen square meters ,to operate it .It just takes 10 minutes to inflate the slides and it can be operated at any time and any where! Generally, with 100 shares PVC tarpaulin, it has strong tensile strength about 3478N, tear strength about 1572N, adhesion force about 188N/5cm.Above all, it can stand the temperature form the lowest coldness -30 Celsius degree from the highest +65 Celsius degree. In short, it has greatly enhanced its usage time.